This article is about the section of Interstate 40 in North Carolina. For the entire route, see Interstate 40. Interstate 40 (I-40) is a part of the Interstate Highway System that runs from Barstow, California to Wilmington, North Carolina. In North Carolina, I-40 enters the state along the Pigeon River Gorge, from Tennessee. Crossing the entire state, it connects the cities of Asheville, Winston-Salem, Greensboro, Durham and Raleigh before ending along U.S. Highway 117/North Carolina Highway 132 (US 117/NC 132) in Wilmington. The landscapes traversed by I-40 include the Blue Ridge Mountains, foothills of western North Carolina, suburban communities, the urban core of several Piedmont cities, along with eastern North Carolina farmland. At a total of 423.55 miles (681.64 km), it is the longest interstate highway in North Carolina. 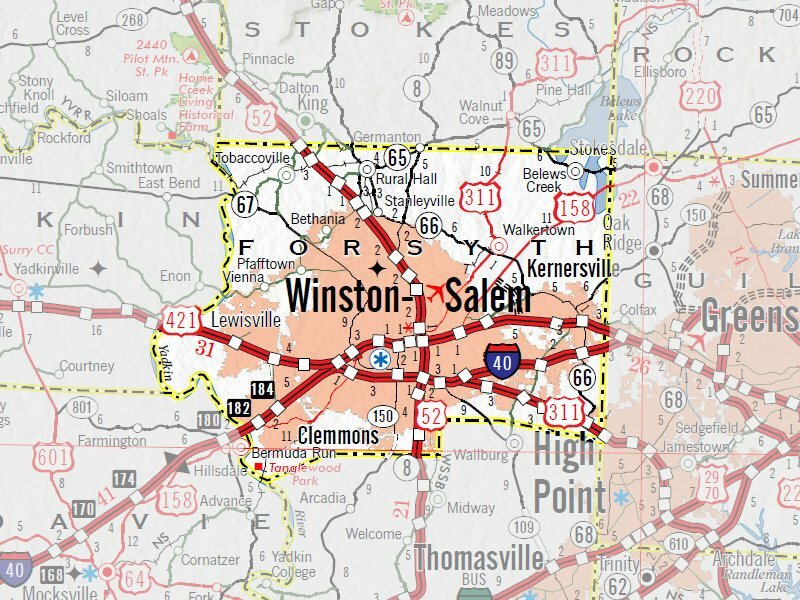 There are five auxiliary Interstates in the state related to I-40, as well as one business loop which currently runs through Winston-Salem. The route is labeled east-west for the entire route (as are all even-numbered Interstate highways), however the eastern portion (from Hillsboro to Wilmington) follows a much more north-south alignment. The freeway bears several names in addition to the I-40 designation. Throughout the state the freeway is known as the Blue Star Memorial Highway a name shared with multiple interstates across the state. From the Guilford-Alamance county line to one mile east of NC 54, in Graham, I-40/I-85 is known as the Sam Hunt Freeway. From Orange County to Raleigh I-40 is known as the Harriet Morehead Berry Freeway, the John Motley Morehead, III Freeway, and the Tom Bradshaw Freeway. I-40 is the James Harrington Freeway from US 70 to I-95. In Duplin County a section of I-40 is known as the Henry L. Stevens, Jr. Highway. From the Pender County-New Hanover County line to the eastern terminus of I-40, the freeway is known as the Michael Jordan Highway. Interstate 40 was an original Interstate Highway planned in the Federal Aid Highway Act of 1956. In North Carolina the original highway was to run from the Tennessee state line to Greensboro where the freeway would end at Interstate 85. In 1958, the first section of completed interstate highway in the state was I-40 along the East–West Expressway in Winston-Salem. I-40 received two extension approvals; the first in 1969 to Interstate 95 (I-95), to be routed in or near Smithfield, and the second in 1984 to Wilmington. After 34 years since it first opened, the last section completed was the Winston-Salem Bypass in 1992. The highest point is at 2,786 feet (849 m), located at Swannanoa Gap, and the lowest point is at 15 feet (4.6 m), located at the Pender–New Hanover county line. I-40 travels through several diverse regions in North Carolina, including the Great Smoky and Black mountains of Western North Carolina, the rural Foothills, the urban Piedmont, and the farmlands of Eastern North Carolina. All of I-40 is listed in the National Highway System, a network of roads important to the country's economy, defense and mobility. I-40 is also designated as a Blue Star Memorial Highway throughout the state. I-40 enters North Carolina along the north banks of the Pigeon River, at the foot of Snowbird Mountain. Winding in parallel with the river, I-40 goes through twin tunnels. When the tunnels opened in 1968 they were the first Interstate tunnels east of Mississippi River. I-40 then proceeds through the Pigeon River Gorge for the next 16 miles (26 km). Just south of exit 7, I-40 uses another tunnel, for eastbound traffic only, through Hurricane Mountain. The westbound lanes use a rock cut through Hurricane Mountain. A short distance after the tunnel is the North Carolina Welcome Center. Immediately afterwards is Waterville Lake, where there are a few at-grade intersections in this location, used as service access for Walters Dam and the Harmon Den Wildlife Management Area. I-40 continues toward Asheville. Interstate 40 then merges with US 74 (Great Smoky Mountains Expressway). I-40 and US 74 encounter the Interstate 26, Interstate 240 interchange, sometimes called Malfunction Junction, in the southwestern part of the city. The interchange is the current western terminus of Interstate 240 and the historic terminus of Interstate 26. Interstate 40 then goes along the south side of Asheville, north of the Biltmore Estate towards Hickory. I-240 and I-40 have another interchange before I-40 leaves the Asheville area. Shortly after it leaves the Asheville area, I-40 encounters a steep grade, Old Fort Mountain, with winding roads that poses a hazard to truck traffic. There are several runaway truck ramps on this part of the highway. This stretch is about six miles long. Interstate 40 goes south of Black Mountain and Marion, and north of Conover. When I-40 enters Hickory it has a clover interchange with US 321. Interstate 40 then heads south of Hickory and crosses Catawba River. I-40 enters Statesville north of the city. It has major interchanges with US 64 and US 21 before utilizing a clover interchange with Interstate 77. I-40 heads northeast towards Winston-Salem passing Mocksville and Clemmons. When Interstate 40 enters Winston-Salem it has another major interchange this time with US 421 and Interstate 40 Business. I-40 Business/US 421 head north to go through downtown Winston-Salem while I-40 goes just south of the city. Interstate 40 has another clover interchange with I-285/US 52/NC 8. Interstate 74 exit off to the south while I-40 heads back northeast to meet up with US 421 and Interstate 40 Business. US 421 runs a concurrency with I-40 into Greensboro. Interstate 40 enters the Greensboro area at the I-73/US 421/I-840 interchange. This interchange is the east end of the US 421 concurrency with I-40 and is also the planned western terminus of Interstate 840. From there Interstate 40 heads through southwestern Greensboro. Interstate 40 passes Wendover Place and Four Seasons Town Centre before having another large interchange with US 220. 1 mile after the interchange with US 220 US 29/US 70 all merge into I-40/US 220 for one large concurrency. The road is generally a six-lane freeway throughout. This 2.5-mile (4.0 km) corridor with concurrent routes ends in the east at the US 29/US 70/US 220/Martin Luther King Jr. Boulevard junction. Both the beginning and ending interchanges of this corridor are quite unusual in design and are often operating at above full capacity, leading to frequent traffic jams and traffic incidents. I-40 through Greensboro officially bears the name Preddy Boulevard. The nickname "Death Valley" has been given to the area of Interstate 40 where Interstate 40 and Business Interstate 85 splits. The locals have given that area that name because of the high number of deaths due to car crashes in that area. One major problem with the highway is that the US 29/US 70/US 220 southbound lanes merge from the right, and exit to the left. Thus, through traffic on I-40 west and US 29 south (a major route from Virginia to Charlotte) must all merge to the other side of the freeway. A study conducted by state traffic engineers from May 1, 2006 to April 30, 2008 (the period between the I-85 relocation and I-40's relocation) concluded that "the Death Valley area" had an accident rate "higher than average for urban interstates ... but the [route] was safe anyway." There were no fatalities during the study period, but a large number of rear-end collisions. I-40 merges with I-85 east of Greensboro ending the I-85 concurrency. I-40 and I-85 have a 31 miles (50 km) concurrency through Guilford, Alamance, and Orange Counties. The concurrency section uses I-85 exit numbers instead of I-40 exit numbers. The section goes south of Elon, Burlington, Graham, and Mebane. Interstate 40 breaks ways from Interstate 85 at exit 163, south of Hillsborough. After I-40 breaks away from I-85 it heads in a very southeasterly direction towards Chapel Hill. I-40 parallels NC 86 until NC 86 crosses I-40 at exit 266. I-40 is routed along northern Chapel Hill and then through southern Durham. I-40 enters the Research Triangle Park after an interchange with NC 147. The Interstate varies in width, from four-lane to eight-lane depending on the location. It serves as a major route between Raleigh, Cary and Durham (the other being US 70). After leaving the Research Triangle area Interstate 40 has an interchange with Interstate 540 near the Raleigh-Durham International Airport. Several Interstate 40 exits serve Raleigh-Durham including, Aviation Parkway, Airport Blvd, and Interstate 540. I-40 continues to head southeast towards Downtown Raleigh. Interstate 40 is routed north of Cary and south of Umstead State Park. At Wade Avenue Interstate 40 bears right to head south. US 1, US 64, Interstate 440, and I-40. I-40 then runs a concurrency with US 64 along the south side of Raleigh before merging to the right to head toward Benson. The freeway bears several names in addition to the I-40 designation. Throughout the state the freeway is known as the Blue Star Memorial Highway a name shared with multiple interstates across the state. From the Guilford-Alamance county line to one mile east of NC 54, in Graham, I-40/I-85 is known as the Sam Hunt Freeway. The freeway is known as the Harriet Morehead Berry Freeway through Orange County named for a leader in the good roads movement in North Carolina. Between US 15/US 501 in Chapel Hill to NC 147 in Durham, I-40 is known as the John Motley Morehead, III Freeway who was a noted philanthropist and graduate from the University of North Carolina Chapel Hill. I-40 is the Dan K. Moore Freeway from Research Triangle Park to the Tom Bradshaw Freeway. The section is named after Dan K. Moore who was the 66th Governor of North Carolina. From the Wade Avenue Extension to US 70 in Garner the freeway is known as the Tom Bradshaw Freeway, named after the 33rd Mayor of Raleigh. I-40 is the James Harrington Freeway from US 70 to I-95. In Johnston, south of I-95, and Sampson counties, I-40 is dedicated to Robert D. Warren, Sr., who was a former State Director of Driver's Licenses and State Senator from the area. In Duplin County a section of I-40 6.95 north of NC 24 west of Warsaw to 6.95 south of NC 24 is known as the Henry L. Stevens, Jr. Highway, who was a commander of the American Legion and a Superior Court judge. From the Pender County-New Hanover County line to the eastern terminus of I-40, the freeway is known as the Michael Jordan Highway, named after the famous basketball player who grew up in Wilmington and was a graduate of the University of North Carolina-Chapel Hill. Interstate 40 has also been given the name Tobacco Road by college sports fans, because the freeway links up the four North Carolina schools in the ACC. Authorized by the Federal Aid Highway Act of 1956, North Carolina was originally allocated 714 miles (1,149 km) for their share of the Interstate Highway System; 219 miles (352 km) of which was subsequently allocated for a route from the Tennessee state line, through Asheville and Winston-Salem, to Greensboro. Designated as I-40, it became the first interstate in the state after opening on a completed three-mile-long (4.8 km) section in Winston-Salem, in 1958. For the next 32 years, I-40 was constructed and extended twice to its current routing from the Pigeon River Gorge to Wilmington. The first major overland transportation corridors in North Carolina were the Indian trading paths. One of these, the Rutherford's Trace, followed the path of modern I-40. In 1921, the North Carolina Highway System was established, with NC 10, nicknamed the "Central Highway," designated on the route between Asheville and Greensboro. By the time US 70 was established, in 1926, and placed on concurrency on all of NC 10, nearly all of the route was either paved or oil-treated. After World War II, the federal government began planning on a new Interregional Highway system, as mandated by the Federal-Aid Highway Act of 1944, and released a proposed National System of Interstate Highways in 1947, which included a route that followed loosely to US 70, from the Tennessee state line to Greensboro. After years of planning and the passing of the Federal Aid Highway Act of 1956, which established the route between Tennessee and Greensboro, AASHTO approved the I-40 designation in 1957. In 1958, the first construction job in the country that was designated specifically for I-40 was in Haywood County, along the Pigeon River. That same year, the first two sections of I-40 opened: the first was the three-mile-long (4.8 km) East–West Expressway in Winston-Salem; the second was from US 421, in Kernersville, to US 29/US 70, in Greensboro. 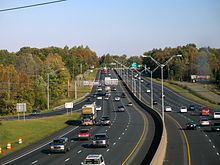 In both cases, these first freeways were constructed a couple of years prior, for US 158 and US 421 respectively, and did not benefit from the 1956 Act; as a result, in 1988 the state was able to convenience the Federal Highway Administration (FHWA) in building the Winston-Salem Bypass. In 1960, I-40 made three expansions: In Burke County, from Dysartsville Road (SR 1129) to Hildebran (connecting to US 64/US 70 along I-40 Access Road SE (SR 1890)); from NC 16, in Conover, to NC 90, in Statesville; and from NC 801, near Advance, to the US 158/US 421 split, east of Winston-Salem. In 1961, I-40 extended west from Dysartsville Road to NC 226, near Marion. In Statesville, I-40 extended east along a completed widening project of US 64 Bypass, between NC 90 to US 64. Between Ridgecrest and Old Fort, US 70 along Youngs Ridge was widened to four-lane; however, I-40 was not officially designated until 1982, after additional highway improvements including additional widening, runaway truck ramps and warning devices. In 1962, I-40 extended west from NC 226, near Marion to link-up with US 70, near Old Fort. In 1963, the gap between Winston-Salem and Kernersville was completed. In 1964, I-40 opened a 12-mile (19 km) segment from east of Clyde (using the freeway connector from US 19/US 23) to Wiggins Road (SR 1200). In 1967, I-40 opened a 3.8-mile (6.1 km) segment through the Biltmore Estate, from NC 191 to US 25. In 1968 and after twenty years of construction, the I-40 opened a 20-mile (32 km) segment from the Tennessee state line to US 276, in Cove Creek. In November of same year, the North Carolina State Highway Commission submitted a request to the Bureau of Public Roads to extend I-40 east of Greensboro to Raleigh, via the Research Triangle Park (RTP). In 1969, both the Bureau and AASHTO approved the extension, allowing I-40 to continue east of Durham, through Raleigh to Smithfield. 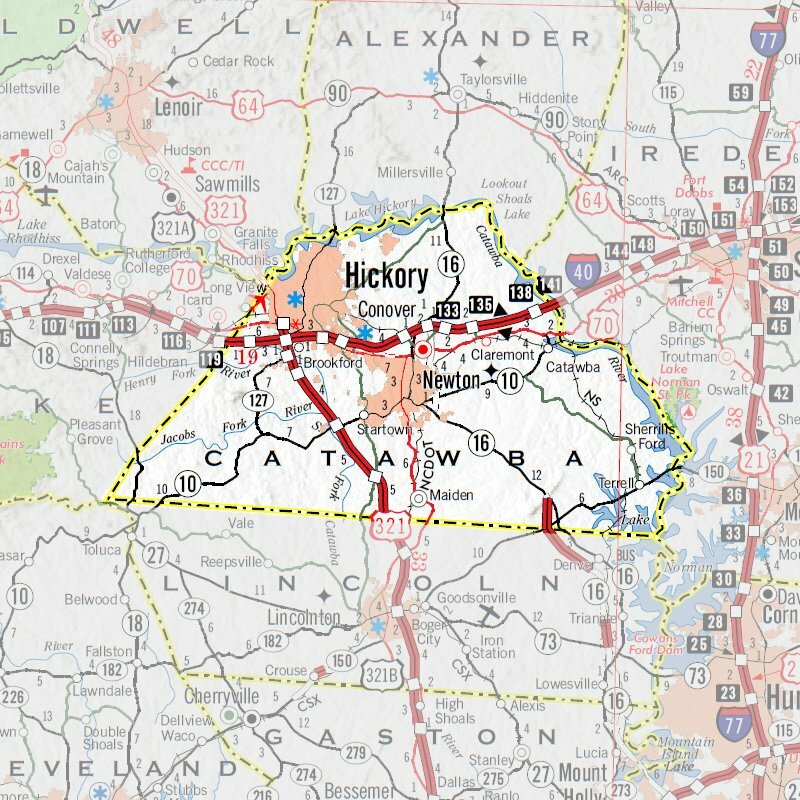 Also in the same year, I-40 was extended west from NC 191 to connect with I-26 and end at US 19/US 23, in Enka. In 1970, I-40 extended west from NC 801, near Advance, to US 64, near Mocksville. In 1971, two gaps were completed: Wiggins Road (SR 1200) to US 19/US 23, in Enka; and US 64, in Statesville, to US 64, near Mocksville. In July, NCSHC finalized a plan for I-40's routing east of Durham to Smithfield, with an estimated cost of $75 million. In December, new freeway opened between Davis Drive (SR 1999), in the RTP, to US 1/US 64 (Raleigh Beltline), in Raleigh; I-40 was added along 7 miles (11 km) between Davis Drive and Harrison Avenue (SR 1654), while east of Harrison Avenue (future Wade Avenue) was signed "To I-40." 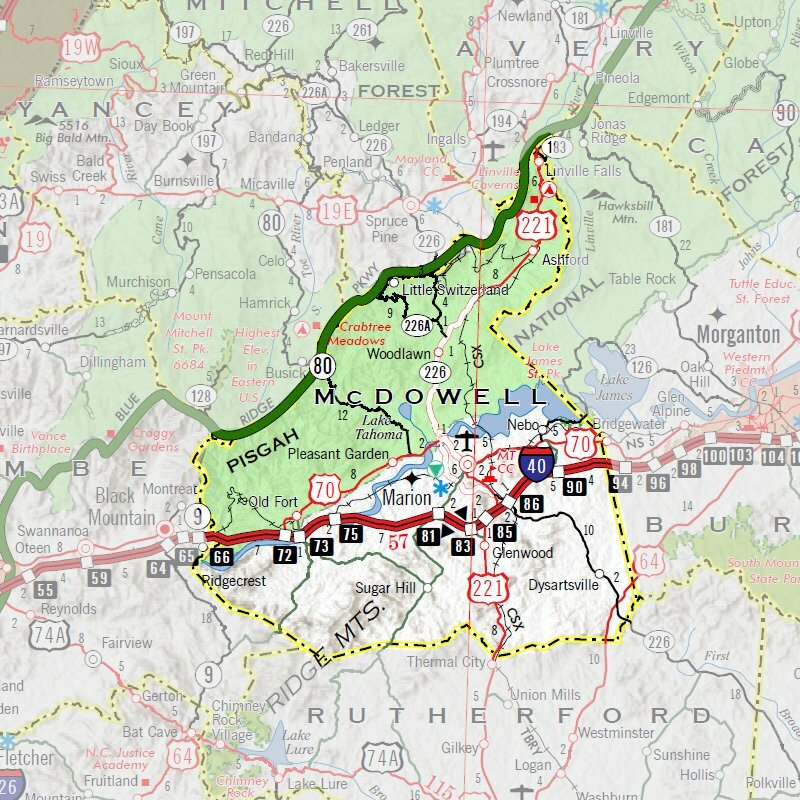 In 1972, I-40 extended east from US 25, in Asheville, to Porters Cove Road (SR 2838), in Oteen; the extension bypassed both US 25A and US 74, interchanges were built in 1999 and 1973 respectively. In 1973, I-40 and the Durham Freeway (future NC 147) were connected, in the RTP. In 1974, a gap was completed between US 276, in Cove Creek, to the freeway connector (future Great Smoky Mountains Expressway), near Clyde. I-40 also extended east from Porters Cove Road, in Oteen, to Patton Cove Road (SR 2740), in Swannanoa. In 1976, a gap of I-40 was completed between Henry River Road (SR 1002), in Hildebran, and NC 16, in Conover. In April 1978, after years of debate on where I-40 should be routed east of I-95, either Morehead City or Wilmington, NCDOT approved a corridor location between Raleigh and Wilmington. The discussions on its routing started since the initial extension in 1969 and arguments from several area groups why the routing should go to their port city. In the end, the routing approval to Wilmington came with a caveat to build new freeway in parallel to US 117 instead of a full upgrade of US 421 as several in the region supported. In 1979, I-40 was extended east from Patton Cove Road, in Swannanoa, to US 70, in Ridgecrest. In 1982, I-40 was designated, in concurrency with US 70, along Youngs Ridge, between Ridgecrest and Old Fort; this officially completed the original I-40 routing from Tennessee to Greensboro. In 1984, I-40 was extended in Raleigh from Wade Avenue (exit 289), along the Tom Bradshaw Freeway, to the Cliff Benson Beltline (exit 301). Also same year, AASHTO approved of designation of I-40 between Wallace and Wilmington, currently under construction at the time. By 1985, construction began on a 22-mile (35 km) project, connecting the Durham Freeway, in the RTP, with I-85, west of Hillsborough, at an estimated cost of $103 million. In 1985, I-40 was placed on new 19-mile (31 km) section between US 117 (exit 390), near Willard, and NC 210 (exit 408), near Rocky Point. In 1986, I-40 was extended west from the Durham Freeway (exit 219) to NC 55 (exit 218), in the RTP; I-40 was also extended east to its current eastern terminus at US 117/NC 132 (exit 420), in Wilmington. In 1987, I-40 was extended west from US 117 (exit 390), near Willard, to NC 42 (exit 385), near Tin City. In 1988, I-40 was extended west to US 15/US 501 (exit 270), in Chapel Hill, and east to US 70 (exit 306), in Garner. In October, Gov. James G. Martin announced federal approval of $114.1 million for I-40 to be relocated around Winston-Salem. In 1989, I-40 was extended west to I-85 (exit 259), west of Hillsborough, and east to I-95 (exit 328), in Benson. By 1990, I-40 was extended west from NC 41 (exit 385), in Tin City, to US 117 (exit 369), near Warsaw. On June 29, 1990, with a ribbon-cutting by Gov. James G. Martin, I-40 was connected between Raleigh and Wilmington, providing improved access with the Port of Wilmington with the rest of the state. At around this time, a standard distance sign near the start of the westbound section of I-40 in Wilmington indicates the distance to Barstow, California, as 2,554 miles (4,110 km). In December, AASHTO approved the I-40 designation between Raleigh and Wallace; and in January 1991, NCDOT certified the designation. In or around 1992, the final gap of I-40 was completed when it was designated along existing I-85, from Greensboro to west of Hillsborough. In November, the 20.89-mile (33.62 km) Winston-Salem Bypass was completed and opened; featuring mostly new construction, with a short overlap of existing US 311 freeway. The former alignment, featuring the first sections of I-40 completed in the state, was designated as I-40 Business, with a complete concurrency with US 421. After 34 years, I-40 was officially completed in North Carolina. In 1996, 35 miles (56 km) of I-40/I-85, through Alamance and Orange counties, were widened to eight lanes. At a cost of $175 million, the project began in 1989 and opened completed sections in phases. In December 2004, an 10.6-mile (17.1 km) widening project was completed from US 15/US 501 (exit 270), in Durham, to NC 147 (exit 279), in the RTP. The project expanded lanes from four to six-lanes. In March 2005, construction crews returned for eight weeks to replace asphalt used in the widening project, which began to deteriorate not long after the lanes opened to the public. However, the paving mistakes were more severe and NCDOT contracted Lane Construction Corp to replace all the bad concrete used in the botch widening project, at a cost of $21.7 million. In 2011, an 8-mile (13 km) widening project was completed between Harrison Avenue (exit 287) and Gorman Street (exit 295). At a cost of $49 million, the project expanded lanes from four to six-lanes. The first section of I-40 in North Carolina is the section that travels through the Pigeon River Gorge in Haywood County. Known locally as simply "The Gorge", this part of I-40 cuts a path from the Tennessee state line to Waynesville. This section of the interstate is curvy and tends to become a bit narrow in some places when compared to other portions of the highway. Because much of the road was cut through mountainside and along the river, concrete retaining walls have been built on both sides of the road and in the median, cutting down on the width of the breakdown lanes. Coupled with speeding vehicles, the thick fog that tends to plague the area, winter weather, and little room to maneuver in case of accident, this area has become notorious for its severe and many times fatal accidents. It is reported that a person is 20 times as likely to die on I-40 in Haywood County than they would be to win the Powerball lottery, which equals to be twice the average of any other Interstate Highway in North Carolina. Even some minor accidents have been known to tie up traffic in this area, because there is little room to move accidents off or to the side of the road with the terrain. Speeding semi trucks have been a problem in the gorge and have subsequently led to many accidents. In 2002 and 2003, two state troopers were killed in two separate accidents by speeding trucks that drifted off the road and hit their police car conducting a traffic stop. This led the North Carolina Highway Patrol to crack down on speeding tractor trailers and speeders in general through the area. This portion of the highway is also notorious for rockslides and rocks falling onto the highway. The main cause is an engineering flaw, in that sections of the highway have been built on the north side of the Pigeon River, where the rock strata foliate towards the highway. In 1985, a severe rockslide buried the westbound entrance to one of two tunnels that carry the highway through the gorge. Repair of the slide area and the tunnel required shifting westbound traffic to the eastbound tunnel, while eastbound traffic was diverted onto a temporary viaduct around the tunnels. In July 1997, a rockslide near the Tennessee state line closed the entire road for nearly three months. In 2009, a large rockslide at mile marker 2.6 along I-40 near the Tennessee State Line shut down the freeway for several weeks. While the slide only caused minor injuries, it shut down Interstate 40 in both directions. In February 2008, I-40 was relocated onto the Greensboro Western Urban Loop, marking the first change to I-40 since the Winston-Salem Bypass opened in 1992. At a cost of $122 million, it was constructed by Archer Western Contractors of Atlanta and took four years complete. NCDOT Secretary Lyndo Tippett said that "the opening of the Greensboro Western Urban Loop is a major step in improving the mobility of the Triad region" and that "the highway will provide better access for motorists in and around Greensboro, as well as those traveling between the eastern and western areas of our state." The new routing was placed in concurrency with I-73, while its former alignment became an extension of I-40 Bus. The glowing sentiment the NCDOT Secretary gave on the new I-40 routing was unfortunately not reciprocated. NCDOT received many complaints by local residents and motorists on the confusion between "Blue" 40 and "Green" 40. Greensboro residents also had concerns with the resulting increased traffic and noise. On September 12, 2008, seven months after the initial switch and in agreement with Greensboro DOT and FHWA, to reroute I-40 to its original route through the city, decommission I-40 Bus., and leave I-73 and I-85 as the only interstates signed along the loop. Exit numbers on the western segment of the loop were to be replaced with I-73 exit numbers; while exit numbers along I-40 Bus. would be changed over to I-40 exit numbers. At a cost around $300 thousand, all signage was replaced by July 1, 2009. In November 2009, US 421 was rerouted onto the Urban Loop, replacing most of I-40's brief alignment around Greensboro. The current alignment of I-40 is four miles (6 km) shorter than the 2008 Urban Loop routing, and is the quicker route for any vehicle consistently traveling at the posted speed limits. Begun in 2013, an extensive project known as "Fortify" (a play on the route number "40") is underway to completely overhaul I-40 along the southern edge of Raleigh, from the I-40/U.S. 1/U.S. 64 interchange (Exit 293) near Cary Crossroads through the I-40/I-440 split (Exit 301) in Southeast Raleigh, including the easternmost 2 miles of I-440 as well. The project has, among its goals, a complete tear down and rebuild of the roadway, widening of the roadway, rehabilitation and widening of bridges and overpasses along the entire route, and extension and widening of several highly congested exit and entrance ramps. The project was divided into two phases, the first (completed in the summer of 2015) was a rebuilding and repaving of I-40 and I-440 from I-40 Exit 301 to I-440 exit 14. The second phase, currently underway, is the more extensive rebuild of I-40 from Exit 293 to Exit 301. In Statesville, the I-40/I-77 interchange (exit 152) is currently being upgraded. The upgrade is planned in three phases: reconstruction of nearby intersections on both interstates, reconstruction and widening of I-40/I-77 interchange, and construction of fly-overs at interchange. The estimated cost for the entire project is $251 million with construction to begin in March 2012. It will replace the current interchange, which was built in the late 1960s. A widening project along Interstate 40 is in development stage, between mile markers 259 and 279, in Orange and Durham counties. The estimated cost is $18 million, with date of construction to begin February 2019. However, it is currently flagged by NCDOT as "Subject to Reprioritization." A widening project along Interstate 40 is in development stage, between mile markers 301 and 312, in Wake and Johnston counties. The estimated costs have yet to be determined. Property acquisition is to start late 2013 thru 2015. The project is closely associated with the extension of NC 540 (the Southern Wake Freeway) which will tie in with I-40 at the current Exit 309 (Clayton Bypass, US 70). 211.0 131 NC 16 Permanently closed by 2008. ^ a b c d e f g h "I-40 Fact Sheet" (PDF). North Carolina Department of Transportation. June 21, 2008. Archived from the original (PDF) on June 21, 2008. Retrieved June 20, 2014. ^ Staff (October 31, 2002). "Table 1: Main Routes of the Dwight D. Eisenhower National System Of Interstate and Defense Highways as of October 31, 2002". Route Log and Finder List. Federal Highway Administration. Retrieved May 20, 2012. ^ National Highway System: North Carolina (PDF) (Map). Cartography by FHWA. Raleigh: Federal Highway Administration. March 25, 2015. Retrieved April 6, 2016. ^ "What is the National Highway System?". National Highway System. Federal Highway Administration. February 26, 2016. Retrieved April 6, 2016. ^ Haywood County North Carolina (Map) (2009 ed.). Cartography by North Carolina Public Works Commission. North Carolina Department of Transportation. 2009. ^ Boyle, John (October 2, 2016). "Answer Man: Hope for Exit 44 area on I-40? Republicans first?". Asheville Citizen-Times. Retrieved October 2, 2016. ^ Buncombe County (Map). Cartography by North Carolina Department of Transportation. North Carolina Department of Transportation. Retrieved April 30, 2014. ^ McDowell County (Map). Cartography by North Carolina Department of Transportation. North Carolina Department of Transportation. Retrieved April 30, 2014. ^ Catawba County (Map). Cartography by North Carolina Department of Transportation. North Carolina Department of Transportation. Retrieved February 28, 2014. ^ Forsyth County (Map). Cartography by North Carolina Department of Transportation. North Carolina Department of Transportation. Retrieved April 30, 2014. ^ Google (February 27, 2014). "Interstate 40 in North Carolina" (Map). Google Maps. Google. Retrieved February 27, 2014. ^ a b c d e Google (April 23, 2014). "Interstate 40 in North Carolina" (Map). Google Maps. Google. Retrieved April 23, 2014. ^ a b c d e f State Transportation Map (Map) (2013–14 ed.). Cartography by North Carolina State Tax Commission. North Carolina Department of Transportation. 2013. ^ Guilford County North Carolina (Map) (2010 ed.). Cartography by North Carolina Public Works Commission. North Carolina Department of Transportation. 2010. ^ Google (April 23, 2014). "Interstate 40 in North Carolina" (Map). Google Maps. Google. Retrieved April 23, 2014. ^ a b Google (April 23, 2014). "Interstate 40 in North Carolina" (Map). Google Maps. Google. Retrieved April 23, 2014. ^ Greensboro North Carolina (Map) (2011 ed.). Cartography by North Carolina Public Works Commission. North Carolina Department of Transportation. 2011. ^ "Scene of I-40 Triple Fatal Wreck Worries Drivers". Raleigh, NC: WRAL-TV. July 7, 2011. ^ Cavallier, Andrea (December 23, 2013). "One Dead in I-40 Wreck, Lanes Reopened". High Point, NC: WGHP-TV. ^ a b c "Which Way Do We Go?". Winston-Salem Journal. February 1, 2009. p. 1A. ^ Staff. "Rest Areas & Visitor Centers". North Carolina Department of Transportation. Retrieved July 6, 2014. ^ North Carolina State Transportation Map (Map) (2011–12 ed.). Cartography by North Carolina Public Works Commission. North Carolina Department of Transportation. 2011. ^ Staff. "NC Blue Star Memorial Marker Locations". North Carolina Department of Transportation. Retrieved November 24, 2011. ^ Mckown, Harry (1979). "Berry, Harriet Morehead | NCpedia". ncpedia.org. Retrieved June 13, 2016. ^ "Marker: F-63". North Carolina Historical Marker Program. North Carolina Department of Cultural Resources. Retrieved June 13, 2016. ^ Staff (July 15, 2004). "North Carolina Memorial Highways and Other Named Facilities" (PDF). North Carolina Department of Transportation. Archived from the original (PDF) on December 29, 2012. Retrieved November 24, 2013. ^ Staff (July 30, 2015). "Road and Bridge Namings in North Carolina" (PDF). North Carolina Department of Transportation. Retrieved May 24, 2017. ^ "What is Tobacco Road?". Durham, NC: WTVD-TV. Archived from the original on May 21, 2011. Retrieved November 24, 2011. ^ "Interstate Firsts" (PDF). Raleigh: North Carolina Department of Transportation. Archived from the original (PDF) on October 25, 2008. ^ "Map of Rutherford's Trace, 1776". UNC-Chapel Hill School of Education. 2007. Retrieved April 7, 2016. ^ Public Roads Administration (August 2, 1947). National System of Interstate Highways (Map). Scale not given. Washington, DC: Public Roads Administration. Retrieved April 7, 2016 – via Wikimedia Commons. ^ McNichol, Dan (2006). The Roads that Built America. New York, NY: Sterling Publishing Co., Inc. pp. 121–123. ISBN 978-1402734687. ^ 1957 North Carolina Official Highway Map (Map). Cartography by NCSHC. Raleigh: North Carolina State Highway and Public Works Commission. 1957. Retrieved April 7, 2016. ^ 1958 North Carolina Official Highway Map (Map). Cartography by NCSHC. Raleigh: North Carolina State Highway Commission. 1958. Retrieved April 7, 2016. ^ 1959 North Carolina Official Highway Map (Map). Cartography by NCSHC. Raleigh: North Carolina State Highway Commission. 1959. Retrieved April 7, 2016. ^ 1960 North Carolina Official Highway Map (PDF) (Map). Cartography by NCSHC. Raleigh: North Carolina State Highway and Public Works Commission. 1960. Retrieved April 7, 2016. ^ 1961 North Carolina Official Highway Map (Map). Cartography by NCSHC. Raleigh: North Carolina State Highway Commission. 1961. Retrieved April 7, 2016. ^ a b "Route Change (1982-01-01)" (PDF). North Carolina Department of Transportation. January 1, 1982. p. 3. Retrieved April 7, 2016. ^ 1963 North Carolina Official Highway Map (Map). Cartography by NCSHC. Raleigh: North Carolina State Highway Commission. 1963. Retrieved April 7, 2016. ^ 1964 North Carolina Official Highway Map (Map). Cartography by NCSHC. Raleigh: North Carolina State Highway Commission. 1964. Retrieved April 7, 2016. ^ 1967 North Carolina Official Highway Map (Map). Cartography by NCSHC. Raleigh: North Carolina State Highway Commission. 1967. Retrieved April 7, 2016. ^ 1968 North Carolina Official Highway Map (Map). Cartography by NCSHC. Raleigh: North Carolina State Highway Commission. 1968. Retrieved April 7, 2016. ^ U.S. Route Numbering Subcommittee (June 24, 1969). "U.S. Route Numbering Subcommittee Agenda Showing Action Taken by the Executive Committee" (PDF) (Report). Washington, DC: American Association of State Highway Officials. p. 10. Retrieved April 7, 2016 – via Wikimedia Commons. ^ 1969 North Carolina Official Highway Map (Map). Cartography by NCSHC. Raleigh: North Carolina State Highway Commission. 1969. Retrieved April 7, 2016. ^ 1970 North Carolina Official Highway Map (Map). Cartography by NCSHC. Raleigh: North Carolina State Highway Commission. 1970. Retrieved April 8, 2016. ^ 1971 North Carolina Official Highway Map (Map). Cartography by NCSHC. Raleigh: North Carolina State Highway Commission. 1971. Retrieved April 8, 2016. ^ [Highway maintenance map of] Durham County, North Carolina (PDF) (Map). Cartography by NCSHC. Raleigh: North Carolina State Highway Commission. January 1, 1972. Retrieved April 8, 2016. ^ [Highway maintenance map of] Wake County, North Carolina (PDF) (Map). Cartography by NCSHC. Raleigh: North Carolina State Highway Commission. January 1, 1972. Retrieved April 8, 2016. ^ 1972 North Carolina Official Highway Map (Map). Cartography by NCSHC. Raleigh: North Carolina State Highway Commission. 1972. Retrieved April 8, 2016. ^ 1973-74 North Carolina Official Highway Map (Map) (1973-74 ed.). Cartography by NCDOT. Raleigh: North Carolina Department of Transportation. 1973. Retrieved April 8, 2016. ^ 1974-75 North Carolina Official Highway Map (Map) (1974-75 ed.). Cartography by NCDOT. Raleigh: North Carolina Department of Transportation. 1974. Retrieved April 8, 2016. ^ North Carolina Bicentennial Highway Map (Map). Cartography by NCDOT. Raleigh: North Carolina Department of Transportation. 1976. Retrieved April 8, 2016. ^ "'Tremendous boost,' that's how Sampson official sees an interstate highway". Wilmington Morning Star. May 6, 1971. Retrieved June 13, 2016. ^ "Interstate 40 Extension Comes in for Criticism". The Dispatch. Lexington, NC. November 15, 1971. Retrieved June 13, 2016. ^ Dexter, Jim (April 19, 1978). "4-lane road delay in sight". Wilmington Morning Star. Retrieved June 13, 2016. ^ Dexter, Jim (April 22, 1978). "I-40, BOT votes to extend highway to Benson, backs leg to city". Wilmington Morning Star. Retrieved June 13, 2016. ^ 1979-80 North Carolina Transportation Map & Guide to Points of Interest (PDF) (Map) (1979-1980 ed.). Cartography by NCDOT. Raleigh: North Carolina Department of Transportation. 1979. Retrieved April 8, 2016. ^ 1984-85 North Carolina Transportation Map (Map) (1984-85 ed.). Cartography by NCDOT. Raleigh: North Carolina Department of Transportation. 1984. Retrieved April 8, 2016. ^ Special Committee on U.S. Route Numbering (May 23, 1984). "Route Numbering Committee Agenda" (PDF) (Report). Washington, DC: American Association of State Highway and Transportation Officials. p. 10. Retrieved April 8, 2016 – via Wikimedia Commons. ^ "Route Change (1984-08-01)" (PDF). North Carolina Department of Transportation. August 1, 1984. p. 2. Retrieved April 8, 2016. ^ Leland, Elizabeth (July 16, 1985). "Growing Pains: I-40 Construction Rapidly Transforming Rural Areas into World of Sleek High Rises". The Charlotte Observer. p. 1A. ^ 1985 North Carolina Transportation Map (Map). Cartography by NCDOT. Raleigh: North Carolina Department of Transportation. 1985. Retrieved April 8, 2016. ^ 1986-87 North Carolina Transportation Map (Map) (1986-87 ed.). Cartography by NCDOT. Raleigh: North Carolina Department of Transportation. 1986. Retrieved April 8, 2016. ^ 1987 North Carolina Transportation Map (Map). Cartography by NCDOT. Raleigh: North Carolina Department of Transportation. 1987. Retrieved April 8, 2016. ^ "U.S. Approves Money for I-40 Bypass". The Charlotte Observer. October 6, 1988. p. 4B. ^ 1988 North Carolina Transportation Map (Map). Cartography by NCDOT. Raleigh: North Carolina Department of Transportation. 1988. Retrieved April 8, 2016. ^ "I-40 Puts Village in Fast Lane; Triangle Approaches". The Charlotte Observer. Associated Press. October 31, 1988. p. 1D. ^ 1989 North Carolina Transportation Map (Map). Cartography by NCDOT. Raleigh: North Carolina Department of Transportation. 1989. Retrieved April 8, 2016. ^ 1990-91 North Carolina Transportation Map (Map) (1990-91 ed.). Cartography by NCDOT. Raleigh: North Carolina Department of Transportation. 1990. Retrieved April 8, 2016. ^ Special Committee on U.S. Route Numbering (December 8, 1990). "Report of the Special Committee on U.S. Route Numbering to the Executive Committee" (PDF) (Report). Washington, DC: American Association of State Highway and Transportation Officials. p. 10. Archived (PDF) from the original on October 16, 2017. Retrieved April 8, 2016. ^ "Route Change (1991-01-18)" (PDF). North Carolina Department of Transportation. January 18, 1991. p. 2. Retrieved April 8, 2016. ^ Special Committee on U.S. Route Numbering (October 3, 1992). "Report of the Special Committee on U.S. Route Numbering to the Executive Committee" (PDF) (Report). Washington, DC: American Association of State Highway and Transportation Officials. p. 13. Archived (PDF) from the original on October 16, 2017. Retrieved April 8, 2016. ^ "Route Change (1992-11-09)" (PDF). North Carolina Department of Transportation. November 9, 1992. p. 2. Retrieved April 8, 2016. ^ 1992-93 North Carolina Transportation Map (Map) (1992-93 ed.). Cartography by NCDOT. Raleigh: North Carolina Department of Transportation. 1992. Retrieved April 8, 2016. ^ 1993-94 North Carolina Transportation Map (Map) (1993-94 ed.). Cartography by NCDOT. Raleigh: North Carolina Department of Transportation. 1993. Retrieved April 8, 2016. ^ "I-85 Traffic Flow May Be Smoother". The Charlotte Observer. Associated Press. December 16, 1988. p. 5B. ^ "North Carolina: Wider I-85 Recommended". The Charlotte Observer. January 27, 1988. p. 2B. ^ "NC Interstate Widenings Make Road Ahead Rocky". The Charlotte Observer. March 14, 1990. p. 2C. ^ Hall, David A. (November 23, 1994). "Interstate 40/85 Freeway Isn't Free of Construction". Greensboro News & Record. p. A1. ^ Siceloff, Bruce (December 14, 2004). "3rd lane set to open on I-40 E. in Durham". The News & Observer. Raleigh, NC. p. B1. ^ "Fix will shut part of I-40 for 8 weeks". The News & Observer. Raleigh, NC. December 14, 2004. p. B4. ^ Siceloff, Bruce (December 14, 2004). "DOT gets earful on I-40 repair costs". The News & Observer. Raleigh, NC. p. B3. ^ Siceloff, Bruce (December 14, 2004). "I-40's bad concrete gone; lanes open for now". The News & Observer. Raleigh, NC. p. B1. ^ Burns, Matthew (April 25, 2011). "I-40 widening project almost done". Raleigh, NC: WRAL-TV. Retrieved April 8, 2016. ^ Johnson, Becky. "Highway Safety not Always a Priority: Stepped-Up Enforcement Could Save Lives". The Smoky Mountain News. Waynesville, NC. Archived from the original on February 8, 2012. Retrieved May 20, 2012. ^ Tolbert, Eric L. (August 6, 1998). 1997 Annual Report (PDF) (Report). North Carolina Department of Crime Control and Public Safety Division of Emergency Management. Archived from the original (PDF) on June 26, 2008. Retrieved July 6, 2014. ^ Hickman, Hayes (April 25, 2010). "Section of I-40 Closed Since Oct. Rockslide Reopens". Knoxville News Sentinel. Retrieved September 19, 2011. ^ Staff (January 31, 2012). "Interstate 40 West Closed at Exit 20 in North Carolina Near Tennessee Border Due to Rockslide in Tennessee" (Press release). North Carolina Department of Transportation. Archived from the original on September 20, 2012. Retrieved February 4, 2012. ^ Vaughn, Casey (January 31, 2012). "TDOT: I-40 should reopen by Monday following rockslide". Greenville, SC: WHNS-TV. Retrieved February 4, 2012. ^ Burns, Matthew (February 3, 2012). "Rock Slide Occurs on Closed Section of I-40". Raleigh, NC: WRAL-TV. Retrieved February 4, 2012. ^ Staff (February 4, 2012). "Crews Make Progress Cleaning Up Rockslide on I-40 West in North Carolina" (Press release). North Carolina Department of Transportation. Archived from the original on December 24, 2012. Retrieved February 4, 2012. ^ "NCDOT to open I-40/73 Greensboro Western Urban Loop Thursday" (Press release). Raleigh: North Carolina Department of Transportation. February 19, 2008. Retrieved April 8, 2016. ^ "NCDOT will reroute I-40 from Greensboro Urban Loop to Original Location" (Press release). Raleigh: North Carolina Department of Transportation. September 12, 2008. Archived from the original on December 24, 2012. Retrieved April 8, 2016. ^ "DOT to spend at least $300K to reroute I-40 in Greensboro". Raleigh, NC: WRAL-TV. September 15, 2008. Retrieved April 8, 2016. ^ Special Committee on U.S. Route Numbering (October 24, 2009). "US Route Numbering Report to the Standing Committee on Highways" (PDF) (Report). Washington, DC: American Association of State Highway and Transportation Officials. p. 3. Archived (PDF) from the original on October 16, 2017. Retrieved April 8, 2016. ^ "Route Change (2009-11-23)" (PDF). North Carolina Department of Transportation. November 23, 2009. Retrieved April 8, 2016. ^ a b "Project Fortify". ncdot.com. North Carolina Department of Transportation. Retrieved 9 September 2016. ^ "NCDOT: Project I-3819". Archived from the original on October 29, 2011. Retrieved November 1, 2011. ^ "DOT Report: Interchange At I-40, I-77 To Cost $250M". Charlotte, NC: WSOC-TV. Archived from the original on July 3, 2011. Retrieved November 1, 2011. ^ "NCDOT: Project I-3306". Archived from the original on January 9, 2012. Retrieved November 24, 2011. ^ "NCDOT: I-40 Widening: Southeast Raleigh to Clayton Project". Retrieved November 24, 2011. ^ Vieser, Dave (September 24, 2012). "I-40 Exit Will Close as Part of Interchange Improvements". Charlotte Observer. Archived from the original on January 19, 2013. Retrieved October 1, 2012. ^ Spencer, Preston (September 19, 2012). "Part of Greenway Trail to Close until 2015; Exit 153 Eliminated". Statesville Record & Landmark. Archived from the original on February 3, 2013. Retrieved October 1, 2012. ^ "SPOT ID: H129625-AB" (PDF). North Carolina Department of Transportation. May 30, 2014. Retrieved August 31, 2014. ^ U-2579 Project Breakdown (PDF) (Map). North Carolina Department of Transportation. November 26, 2013. Retrieved August 31, 2014. This page was last edited on 21 April 2019, at 21:12 (UTC).